Meet Sandra. In her arms, a photo of her Dad, 'Dood'. Dood was a meticulous dresser. Sandra is wearing his hat, something of her father's she holds dear. Dood was diagnosed with cancer in January 2007. He passed April 19, 2011. Being a caregiver for someone with cancer is an intense experience. They say love will make you do anything. Love made Sandra do everything for her father. So much over the period of four plus years, we cannot even begin to encapsulate the lengths she went to, to give hope and everlasting life, to her father, her mother and the rest of the family. ...asking for permission to speak with his doctor. Dad really did have cancer in his right lacrimal sac and that we needed to remove his eye. Let’s first see, there must be some alternative. ...we heard about a doctor in Vancouver." "It turns out that my husband’s niece is an Ophthalmologist as well and she said the cancer is quite advanced and there is probably not a whole lot they can do for him. My brother-in-law is also a doctor and he advised he is probably going to be terminal in a very short time. ...Dad went through the surgery - about 9 hours. ... I had a shower and then I went back to the hospital – I just could not, not be there. ...we have to remove all his teeth. That just sounded utterly terrible to me. Before we did anything, I called the dad of my daughter’s friend who happened to be a dental surgeon." ...I told Dad: “we have a plan in place now. No teeth getting removed. We will keep your teeth and the dental surgeon said he can take care of it, but if we needed to do that, there is the alternative plan that you will get a set of dentures and we will replace them when we need to." But, I do remember, that he asked me, 'Why me?' I said, “I don’t really know why you Dad. I don’t know why you, why me, why any of us. I just know that that is the way it is.” He asked, 'So, what are we going to do?' It is always "me and him". Sandra is going to know what to do. I said, “Well, here’s the deal. If you have diabetes, you live with diabetes. So, you can do this one of two ways. You can either live with cancer, or you can die from it. You need to decide which one it is going to be. If you want to die from cancer, it is going to be a bit of a lonely journey. If you want to live with cancer – we will do everything we can do to make you live with cancer. So, if you have diabetes, and you don’t take care of it – then you are going to die from it. So, it is like diabetes – you live with it and that is how we are going to go about this.” He says, 'That’s a good plan. That is what I am going to do. I am going to live with cancer.' So you write your own story – you are not going to die from cancer, because you are just waiting for something to happen to you. You are going to live with cancer, like people live with all kinds of things. People live with high blood pressure; people live with diabetes. People live with cancer." 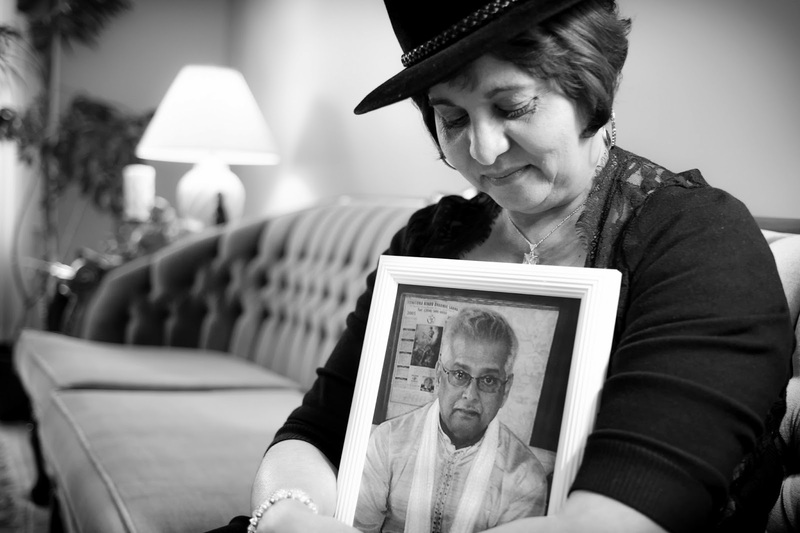 Sandra arranged family trips to Guyana, India and Panama Canal, so her father could experience as much as possible. He was weak and sick but inspired by Sandra, by her faith in him, her love for him. ...I had taken over managing his medication and managing the homecare people coming in; managing his diet; managing his sleep; managing his food – everything. Everything about his life, I was managing. Working full-time and studying full-time but running over to his house every day to make sure he had eaten and rested. Making up all these crazy schedules and charts and graphs and templates of everything, and his medication lists. Writing down everything. I would make sure the homecare people would write down everything. By November he had home care for 22 hours a day. On my instructions, the workers would record what he ate, how much he ate, a glass of juice, a bowl of cereal. Whatever it was. Then he spent his last couple of months at the hospice. I would visit him almost every day on my way to and from work. I would go and sit with him; read to him; tell him what my day was like. He didn’t have a lot of pain – he was on a lot of medication, so he wasn’t living with a lot of pain. The meds seemed to manage it sufficiently. The nurses would tease him – his name was Dood. “Dood, when you go into the shower, you have to stop putting so much powder on your body. We are asthmatic and you are killing us with this powder.” It didn’t matter how terrible he felt – he had to shower every morning; he had to powder himself generously; he had to splash on some cologne. He was meticulous about that. My father was cremated. His ashes we put in the river at a park in Fort Garry. My parents had lived in Fort Garry, and he liked to sit in the park. I cannot say that I would have done anything differently. I was satisfied after my Dad passed away that I had done all that I could do for him and perhaps, that is why I don’t miss him in the way people think that I should – with a kind of a sadness. I had so much time to talk to him about stuff. But, it didn’t just happen after he had cancer – it was always there. I would talk to him about 'Do you remember when so and so did this? Or do you remember this? Or do you remember that time when they had that fire in the ‘60s? Remember that time we went to Florida and we got lost when we all went on vacation? Or when we all went in the car in the snowstorm?' They spent many vacations with us when they came to Canada – we would do things together, or they would come and sit in the backyard or in the sunroom or spend a Sunday afternoon here. I had lots of memories. Someone was asking me – how do you cope with the death of your Dad? I said, “I don’t actually.” They said that was too bad. I said – “I don’t cope with his death – I live with memories of the his life and all he taught me.” I don’t cope with his death, because I then feel like I focus on the days of his cancer. I want to remember all the beautiful memories that we shared together." Sandra has it right. Make a memory today.